1-1-11 (it's so today, so happening right now!) - Stop staring and start sewing! Well it felt like life handed us a lot of lemons in 2010 and I'm so happy we have this one day where we can say "Okay, time for a fresh start!". I know there's nothing magical about a date but the idea of a clean slate is so appealing. We harvested most of our lemons two days ago because we've had freezing weather here in the Southwest (my kids got to see snow falling in the Phoenix area!) and didn't want to lose our bounty. 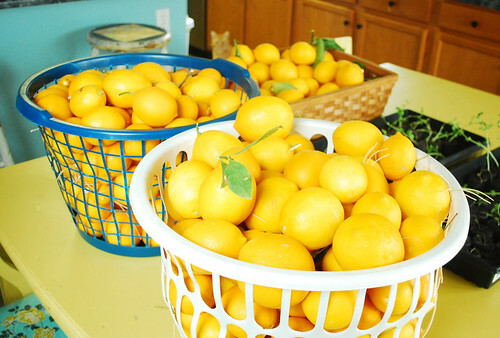 Last year I counted over 100 lemons and this year I'm not even going to count them, there are so many. So tonight we are zesting and squeezing and starting our year with a big supply of lemon curd. Susanne at Stash Books swears by this recipe so we are going to give it a go. We'll freeze a bunch of juice and zest for later. I'm a lemonaholic so this is my idea of wonderful. A fresh start indeed (see my fat orange kitty in the background?)! I'm compiling a list of goals for this year and have already started on some of my professional goals but one of the things I'm most looking forward to is making an effort to add more color and personality to my home. I've done the "neutral colors" thing for too long (7 years in this house) and I've realized we're not going to be selling our home any time soon so I need to make it mine finally and stop worrying about marketing it for a buyer. 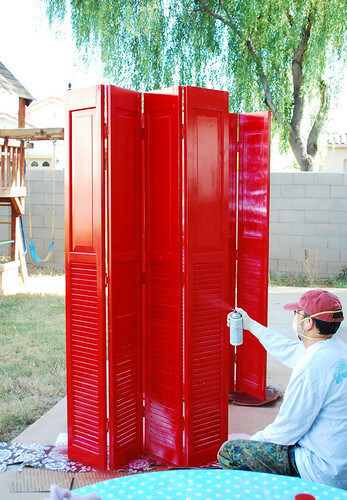 I've started with a few things already but this spray painting project has made me happier than I anticipated. I use these doors to close off my sewing/studio/office space upstairs and while I expected the new color would spruce up the room I didn't realize how much it would brighten up the hallway (on the other side of the doors). It's just the beginning! I'm not one for making resolutions every year but I do like the idea of resolving to savor all the small wonderful moments that happen. Maybe if I had done that last year it would've helped offset some of the hard times a little more. So here's to filling up my "happy bank" a moment at a time.